Oh, look who's back: it's Mattel. Yaaaay. DC Comics Multiverse figures are inspired by comic-based, character-rich entertainment sources, such as movies and video games. These figures are meticulously designed to be truly authentic, celebrating the many universes of entertaining DC Comics material. Geebus-fricking-Cripes, Mattel! Is there really nothing you can't do wrong? Who approved that marketing claptrap bull$#! * text to be shown on the back of a toy package? Stupid maturbatory corporate-speak belongs on internal memos sent between out-of-touch old white men, not on product seen by the public. That's a freaking embarrassment. This isn't "a character-rich entertainment source," this is Barry Allen, the fastest man alive! Tell us about the character, Mattel, not your second-place comicbook license! This isn't just any Barry Allen, either, it's the live-action, CW version! Normally that would make this figure part of the Movie Masters line, but Mattel is now just lumping everything under the DC Multiverse umbrella. Okay by us! The little bit of face we can see poking through his mask does look like Grant Gustin, but he's frowning; Flash is the happiest, sunniest superhero show on TV, and Barry usually looks happy when he's in the suit, so we really should have gotten a smile. The shape of the head looks slightly too round. On the show, it always looks a little taller and thinner, but research for this review turned up plenty of photos of Gustin in the costume that suggest this is correct. 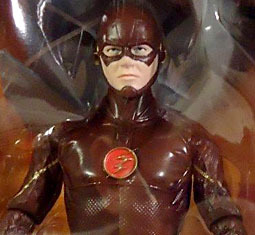 The figure is wearing the second Flash costume - the only significant difference between the first and second was the color behind the lightning bolt emblem, and since this is white instead of red, it's easy to tell which it's supposed to be. The red of his suit is nice and dark, with a few shadows painted on (in the blockiest manner possible), and the golden accents are understated. 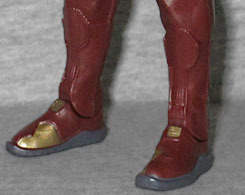 There's a spot on the ankles that should be gold but didn't get any paint, though it's easy to overlook. While the DC Multiverse (or is it DC Comics Multiverse? What are we all agreeing to call this?) line does bring back the Four Horsemen, they're no longer doing the entire thing by themselves - if we had to guess, they're probably doing the comic characters, and Gentle Giant is doing the live-action ones. This figure definitely feels like a digital sculpt - all the little textures on his stomach, shoulders, etc. are just so perfect and precise that it's hard to imagine human hands touching it. Also, the proportions are slightly wonky: his upper arms are too short, so his elbows rest too high and his hands don't hang as far down as they should. Also, both hands are in a super generic "gripping pose," despite the fact that he doesn't come with any accessories and isn't the type to use them anyway - advantage, Speed Demon! Being that this is a Movie Masters-style figure, it shares the Movie Masters major chronic flaw: being the wrong size. 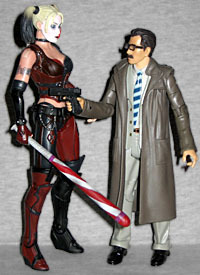 Mattel calls everything "six inches," but still seems to have multiple scales - remember this picture of Harley Quinn towering over James Gordon, despite them both being "six inch" figures? Matty insists on putting the live-action figures in the strict 6" scale, while allowing size creep to hit all their other lines. That means Flash is "tall" at 6⅛" (Grant Gustin is 6'2"), but will look shrimpy if you try to put him next to any comic characters. Fortunately, the articulation has been slightly improved since the Movie Masters days. 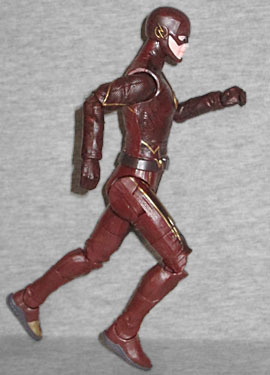 Flash has a balljointed head, swivel/hinge shoulders and elbows (all previous MMs just had plain hinge elbows), swivel wrists and waist, H-crotch, swivel thighs, and hinged knees and ankles. Everything moves fine, but it's still not enough: double-hinged knees and elbows should be a given, you know? 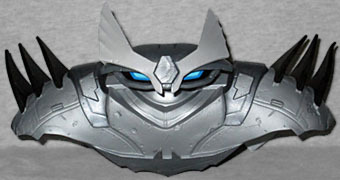 But then again, it's not like they can repaint this mold 60 times and get their money back. The DC Universe Comics Multiverse Classics Comics Universe line sees the return of everyone's favorite made-in-Taiwan BAF knockoff, the Collect & Connect figure! Since the line mixes movie and comic figures, the C&C [Music Factory --ed.] isn't limited to one or the other. Instead of kicking things off in an exciting manner, making Gorilla Grodd or King Shark (yeah, both of those have been on the show - The Flash is awesome! ), Mattel opted to just crib Hasbro's homework by making the "Justice Buster" armor. 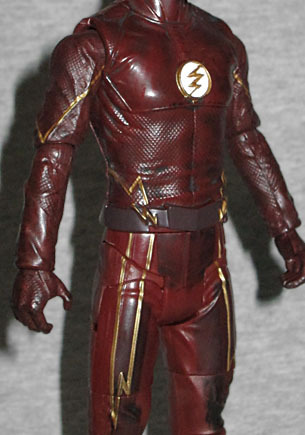 Flash comes with the head and shoulder armor. 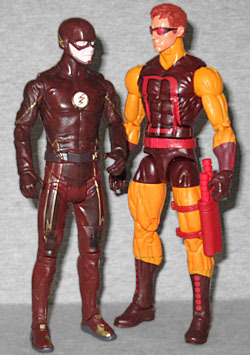 DC Direct made a Flash figure, but I didn't get it - like their Arrow, it was a little oversized to blend with 6" figures, and the sculpt was soft. Plus, it was the first costume, and I figured I'd hold out for the second when they finally did one. Well, they still have yet to make one, so in swoops Mattel! They've delivered the costume I wanted, but the size is still an issue (in the opposite direction this time) and the sculpt and articulation aren't really much better than DCD's. But hey, Build-A-Figure, right?